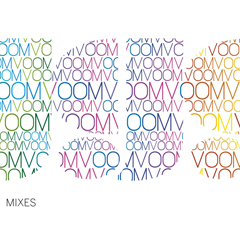 Fantastic trio Voom Voom gets remixed by real good names in brand new ten tracks. Vienna-Munich people, Peter Kruder, Christian Prommer and Roland Appel are top notch names if we talk about jazzy beats, a ray of drum & bass and oeep house. We know them from their other projects; Kruder & Dorfmeister, Peace Orchestra, Trüby Trio and Fauna Flash. Three highgrade poducers whose releases are most of the time keep the labels place rise up. Their latest project Voom:Voom was a new extraction for their more club and dance oriented music. Because whenever the three come together, they only talk about their studios and new technologies. So they decided to make music together and Voom:Voom concept was born in Michael Reinboth's wedding. For a long time they could not gather but in 2006 they managed to release "Peng Peng" the debut of mighty Voom:Voom. This mix album has treated versions of the recent "Peng Peng" tracks. Charles Webster, Deetron, Henrik Schwarz and Wahoo are only a few who has taken Voom:Voom's nice music into a new level with their perspective. A very good remix album full of groove, beats and hunger for the real dance floor experience. Essential release!